This publication provides minimum design and functional requirements, and minimum laboratory performance verification test protocols for qualitative electronic bulk water detectors for use in aviation fuelling. Electronic bulk water detectors are envisaged to be relatively simple insertion-type probes that could be used on mobile into-plane fuelling equipment in the product flow path positioned upstream of filtration equipment to provide a 'go' or 'no-go' signal during aircraft fuelling; the 'no-go' alarm condition being activated in response to a bulk quantity of free water in the line. This publication is intended to apply to any form of detection technology offered for consideration by users and will be of interest to all those involved in aviation fuel handling systems. Note: Bulk water detectors should not be considered as a replacement for filtration and should only be used in conjunction with recognised aviation filtration systems. 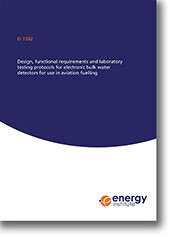 This specification was developed using information contained in EI Research report: Laboratory testing of electronic bulk water detectors for aviation fuelling which documents the development of the testing protocols included in this publication.